Gibson Century-6 Model Lap Steel Electric Guitar (1961), made in Kalamazoo, Michigan, serial # 10301, salmon lacquer finish, maple body, original tweed hard shell case. The late-'40s BR-2 Century was one of Gibson's most strikingly modernistic creations ever; this lovely pink Populuxe delight from 1961 was a later iteration of that somewhat whimsical design. 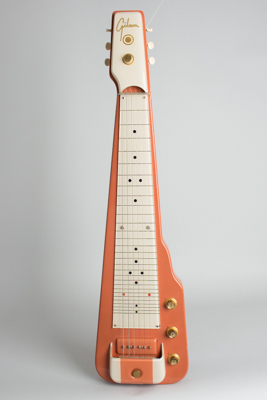 The Century lap steel was a bit less deluxe than its sister the Ultratone but featured a similar oblong asymmetrical body with a backpainted Lucite fingerboard. The instrument's visual character was originally the work of the design firm Barnes & Reinicke, hired by Gibson at the end of WWII to add some new flavor to the company's recipe -- and boy, did they! This is the longest-lived version of the model and features a coral pink (!) lacquer finish -- described by Gibson as "Bittersweet" -- on the maple body, set off with "Beach White" and gold accents. The one-piece metal bridge and headstock are covered by molded, back painted shells -- no unsightly string ends here! The P-90 single coil pickup with adjustable polepieces sits under a pink plastic cover unique to this model. This always great sounding unit provides the tonal muscle to back up the Century's slickly moderne looks. It is controlled by an unusual one-volume, dual-tone-knob circuit for an added range of sound; this 1961 model has the numbered plastic knobs with metal caps typical of that period. The 1960s-era Century was produced in very small numbers (only 52 shipped out this year), but remains one of Gibson's most unique and visually striking instruments. This one comes in its beautiful original rectangular hard case which is oddly VERY similar to a 1950s tweed Fender case, but with a Gibson-style pink plush lining. Go figure! Overall length is 32 1/4 in. (81.9 cm. ), 8 1/8 in. (20.6 cm.) wide at lower bout, and 1 5/8 in. (4.1 cm.) in depth, measured at side of rim. Scale length is 22 1/2 in. (572 mm.). Width of nut is 2 1/4 in. (57 mm.). This steel is very clean and all original, with a few chips to the edges and some checking but very little play wear. The back shows some small "curly cord burn" marks, but overall this is a very nicely preserved steel in an equally nice OHSC. Excellent - Condition.